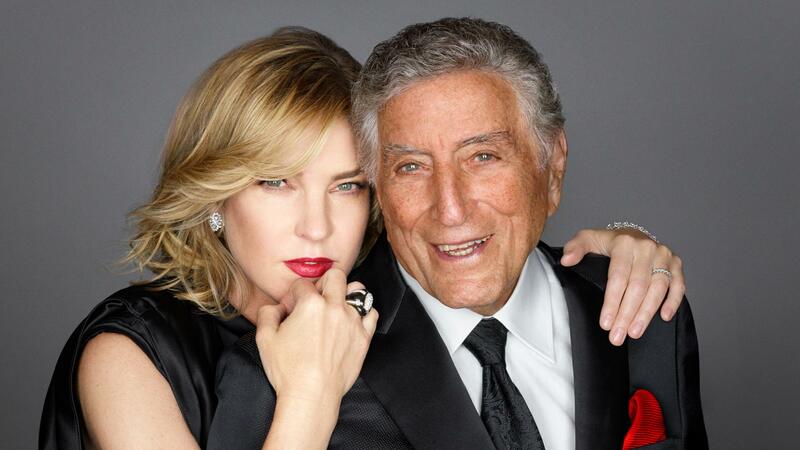 Diana Krall and Tony Bennett released the song "Fascinating Rhythm" ahead of their upcoming album. The first time Tony Bennett recorded the jazz standard "Fascinating Rhythm," he wasn't Tony Bennett. This was the spring of 1949, when the singer born Anthony Dominick Benedetto still went by his original stage name, Joe Bari. "Fascinating Rhythm" happens to be his debut recording — the B-side of a 78-rpm disc produced by the critic George Simon, issued through Leslie Records. For many years, until stumbled across by a collector, it was presumed lost. "The one copy I had literally crumbled in my hands in the 1960s," Bennett noted in his 1998 autobiography, The Good Life. Bennett celebrates his 92nd birthday Friday, and occupies quite a different place in the world than he did back in '49. But some things never change, including his unwavering devotion to what we now call the Great American Songbook. Bennett and Krall are two of the most visible proponents of American popular song, in the classic sense of that phrase. Between them, they have some 20 Grammy Awards (and over 40 nominations); eight albums certified platinum (and more than a dozen gold); and a global audience in the millions. They share an aesthetic of meticulous cool and a bedrock faith in the clear, swinging delivery of a melody. They also share a longstanding friendship, co-headlining a tour in 2000 and recording together twice. Love is Here to Stay will be their first full album together, featuring Gershwin standards like "Nice Work If You Can Get It," "I Got Rhythm" and "They Can't Take That Away From Me." Each artist sings one track alone — Krall caresses "But Not For Me," and Bennett closes the album with "Who Cares?" — but for the most part it's a proper duet album, and less of a stretch than many of the pairings on Bennett's Duets and Duets II, let alone his recent work with Lady Gaga. The companionable contrast of Bennett and Krall's styles is fully apparent on "Fascinating Rhythm." He sings almost with the patter of a show barker, in a punchy staccato; she's as rich and smooth as a pot of chocolate fondue. It almost goes without saying that Bennett has lost some flexibility and vocal luster as a nonagenarian. And yet here he nails — and holds! -- a high G during the outro tag, sounding as if he surprised everybody in the room, including himself. In addition to coming full circle on "Fascinating Rhythm," the Gershwin angle gives Bennett a chance to honor one of the Songbook's greatest wellsprings. There's also a nice resonance with his late career. In 2017, Bennett received a coveted lifetime achievement honor from the Library of Congress — the Gershwin Prize for Popular Song. Love is Here to Stay will be released on Verve and Columbia on Sept. 14, and is available for pre-order here.